New children’s fiction written especially for audiobook? No, really… and from the classics specialist, Naxos AudioBooks? Yes! The Clumsy Ghost and Other Spooky Tales is a collection of six new (and modern) ghostly fables for kids in the tradition of A Christmas Carol and The Canterville Ghost. A ‘presence’ on a film set full of togas in Bath, a clumsy ghost in a stately home, a ghost in a swimming pool, a ghost in Ancient Egypt and a ghostly bit of modern technology… these are among the subjects which will entertain, challenge and send a subtle chill down the family spine, whether on Hallowe’en night or around the Christmas fire. The collection had a curious provenance. Entranced by hearing The Canterville Ghost again, I started looking for more ghost stories for younger ears. The genre was so popular during the Victorian and Edwardian eras that I thought there would surely be an abundance of classic tales to choose from. But no, I couldn’t find anything! 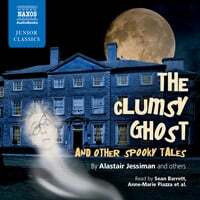 So I approached Naxos AudioBooks’s UK sales manager David Blake, who is, on the quiet, a bit of a ghostly tales buff. He has been exhorting me to programme all manner of spectral fiction, from M.R. James to H.P. Lovecraft… and when I mentioned the absence of junior classic ghost lit., he explained, with some rather English reserve, that every Christmas for many years, he, his wife and two daughters had each written a ghost story and read it – yes… you guessed it… around the Christmas fire. My interest aroused, I asked him to send me a few… and one of them, Unable to Connect, rather set my spine tingling. And this was how The Clumsy Ghost and Other Spooky Tales came about! I then approached other writers. Alastair Jessiman is a Scottish-born writer currently engaged in writing two series for BBC Radio, one of which, The Sensitive, involves a psychic detective. Actually, Jessiman has a rich vein of humour, and so The Clumsy Ghost turned out to be an affectionately entertaining story which gave its title to the collection. Edward Ferrie is the author of Tales from the Greek Legends (one of our bestsellers) and other Naxos AudioBooks recordings. His tale, The Piper Boy, is set in a swimming pool in Newcastle, where he comes from. The Weeping Tree is another tale from that part of the world and was written by his sister, the educator Margaret Ferrie. Roy McMillan is a Naxos AudioBooks regular: a reader, writer and director, and The Stillness evokes the world of pirates… while David Angus, author of many junior texts for us, from Ballet Stories to The Vikings, went back to ancient Egypt for his inspiration for The Book of Imhotep. Last of all, I turned to Anna Britten who, having been my assistant immediately after she left Oxford some 16 years ago, went on to become a journalist and short story writer published by Bloomsbury. Our readers were carefully chosen and came into the studio one by one, including the ten-year-old Harry Somerville, a new voice actor who had never recorded a story like this before. His challenge was Anna Britten’s By the Hot Green Water, which evokes a curious incident in Bath – told through the eyes and experience of a young boy. This is what Harry had to bring to life and he proved a true professional – so much so that he was back in the studio last month, taking on the part of Lucius in our new production of Julius Caesar which we are releasing next year. With carefully chosen music programmed by Sarah Butcher, we have an unusual but gripping collection of tales which shows how much fun publishing, and in particularly audiobooks, can be! I hesitate to highlight the name of David Timson – AGAIN. But I have no option. Recently, Publisher’s Weekly, the key book trade magazine in the US, ran a survey for their readers’ favourite voice of Sherlock Holmes. The winner was: Mr David Timson! Only Edward Hardwicke came anywhere near close. Another accolade for David and his Complete Sherlock Holmes on Naxos AudioBooks. And just to underscore what a polymath he is, it was David who was behind the remarkable (I cannot be modest) production of Goethe’s Faust which we are releasing this month. Mention this jewel of German classic literature to even the very well-read and you get a serious nod as a response: worthy but heavy. Actually, it is anything but! David spent a year reading it, researching the background, the criticisms, the various translations – all in preparation for this outstanding 4 CD recording. His adaptation brought together Parts 1 and Part 2 (written many years apart and featuring very different styles) to make a dramatic whole. We mainly know the work through other versions – Gounod’s opera, for example – but this recording, with Samuel Jones as Faust and Toby Jones as Mephistopheles, shows why it is one of the masterpieces of world literature, for all its oddities. I commend it to you. I am particularly pleased that both these productions have been recognised by AudioFile, the leading American audiobook magazine, to be of exceptional quality, and have each been awarded an Earphone Award, which highlights recordings of special merit.